SemanticEdge’s Aim-Framework (Advanced Interaction Management) offers a new generation of technology for the development, optimising, and managing natural language and personalised dialogue systems. The AIM Framework includes a complete runtime-, development- and management environment and also offers significant efficiency advantages with its attractive tools for developing, running, and quality control of truly natural voice applications. That way, you can significantly reduce the Time-to-Market as well as the Total Cost of Ownership of voice applications. Continuous expansion and adjustment of personalisation rules. 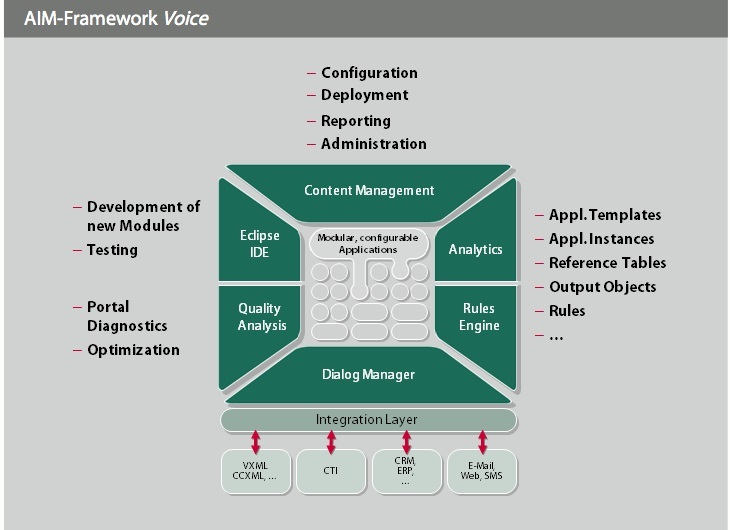 The development environment of the AIM Framework (Dialog IDE) supports the model-based development of voice applications and is very different from other development- and management tools marketed by other manufacturers. IDE development tools allow a seamless transition between the specification and implementation of an application and ensure efficiency in the iterative processes common to speech applications, characterised by short iterative cycles in the applications’ specification and optimising phases. With the management interface, each department has the possibility of making their own changes to the applications, in order to specify different dialogue sequences for each particular group of customers, for example, or to adjust the system announcements during the process and to expand recognition grammar. The AIM-Framework includes a state of the art monitoring system, which is tightly interlocked with the development approach. As the application is developed, automated reporting constructs are generated which can be supplemented using milestones provided by the developer. This allows a detailed analysis of the dialogue sequence down to the finest granularity. The applications thus developed can also be run using other VXML 2.1- compatible IVR platforms.